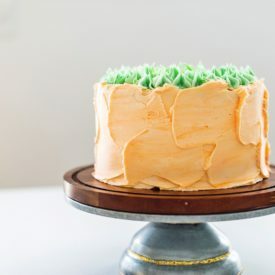 This Carrot Apricot Cake with White Chocolate Pretzel Crack Filling is a new take on an old classic: Ginger spiced carrot cake layers with apricot compote, white chocolate pretzel “crack” filling, and white chocolate buttercream. 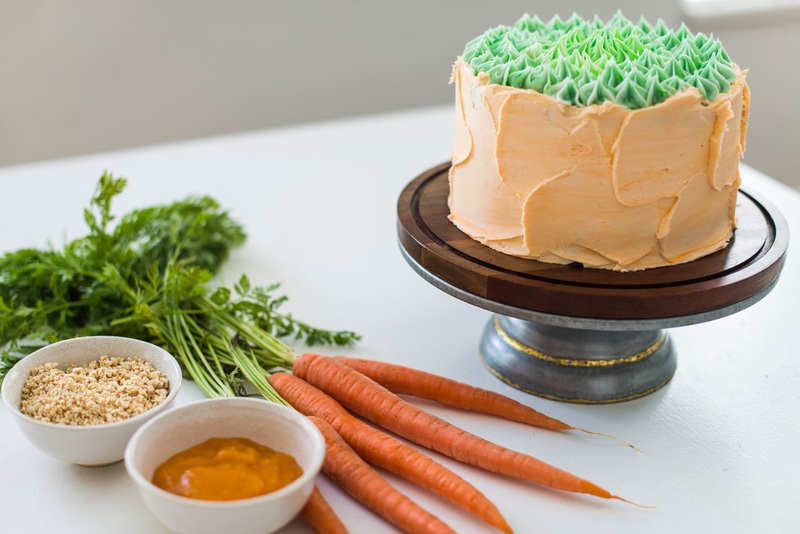 I don’t know about you, but I haven’t always been a fan of carrot cake. Growing up, I would eat (or not eat, in reality) the very traditional version: spiced carrot cake layers with raisins and nuts, covered in cream cheese frosting. I would always take one bite and push my plate away. Nuts, no thank you. Raisins, no thank you. Not in my cakes! 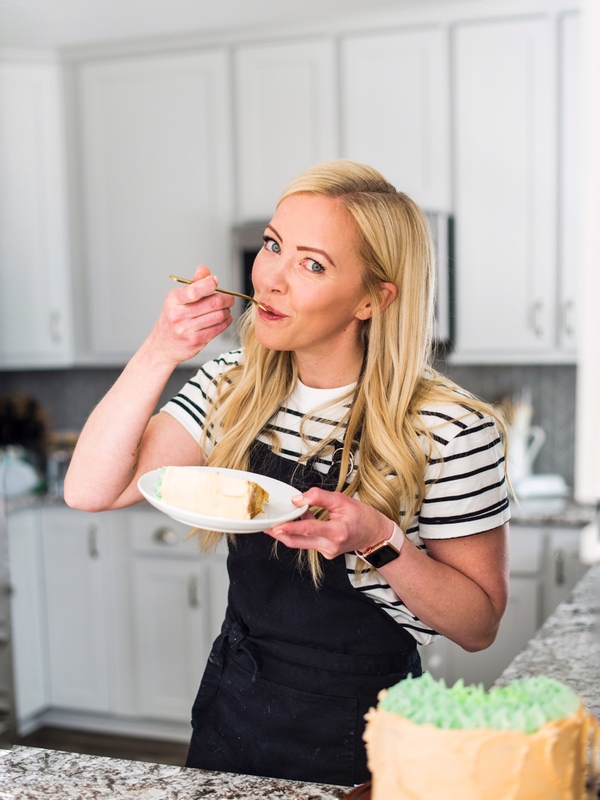 It wasn’t until a couple years ago that I decided to try out a couple of new carrot cake recipes from some of my favorite bakers, including Sweetapolita and Milk Bar’s Cristina Tosi. I was originally drawn to the Sweetapolita recipe because Rosie doesn’t use nuts or raisins in her cake. She also includes candied ginger and orange zest, and used a white chocolate buttercream. All of which I love and knew would taste amazing together in a cake. Rosie’s cake didn’t disappoint in the least. 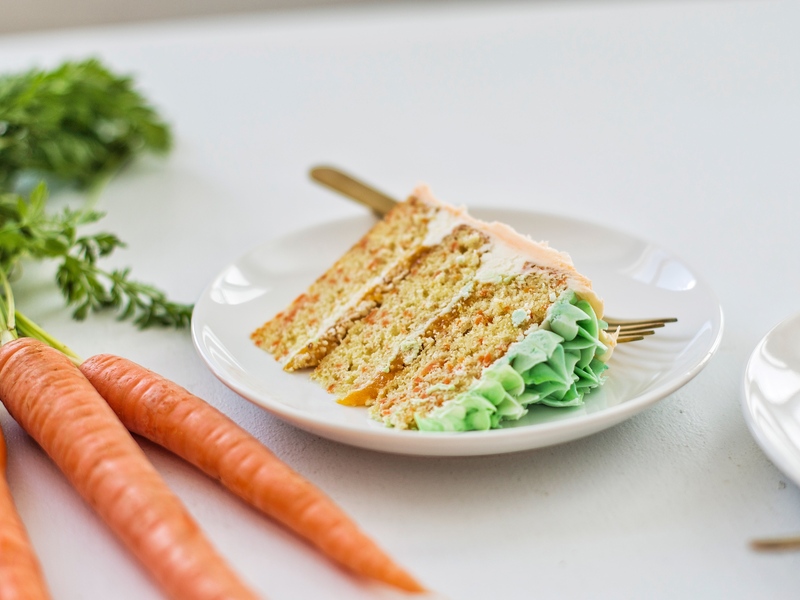 It quickly changed my opinion of carrot cake and became my go-to Easter cake. Then, last year, I decided to try out Milk Bar’s Carrot Cake. 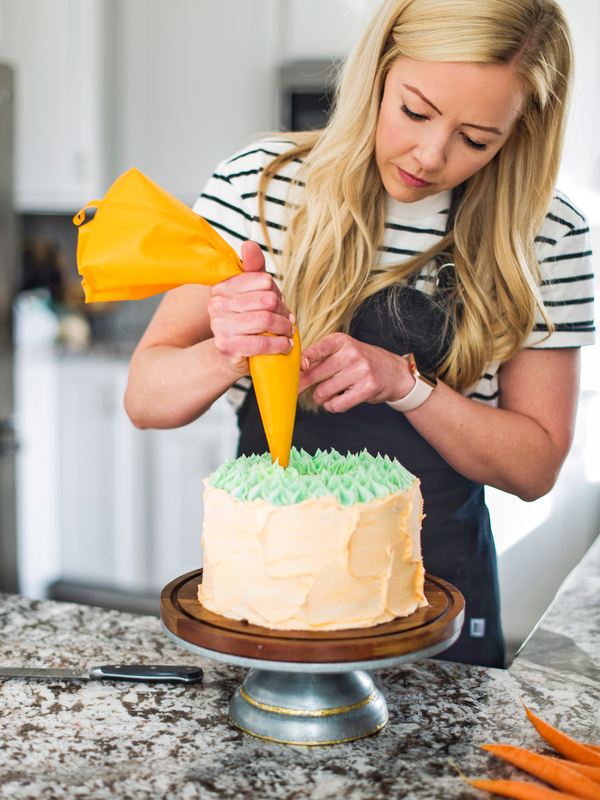 I have loved so many of the Milk Bar cakes and was eager to see how Cristina reinvented this traditional cake. Unfortunately, I was a bit disappointed. The cake itself was pretty much a typical spice cake, and the cheesecake filling was a little overwhelming. I did love the graham cracker frosting and graham crust though! Just all together, the cake wasn’t my favorite. As I was thinking about creating my own carrot cake recipe this year, I knew I wanted to do something with fruit. 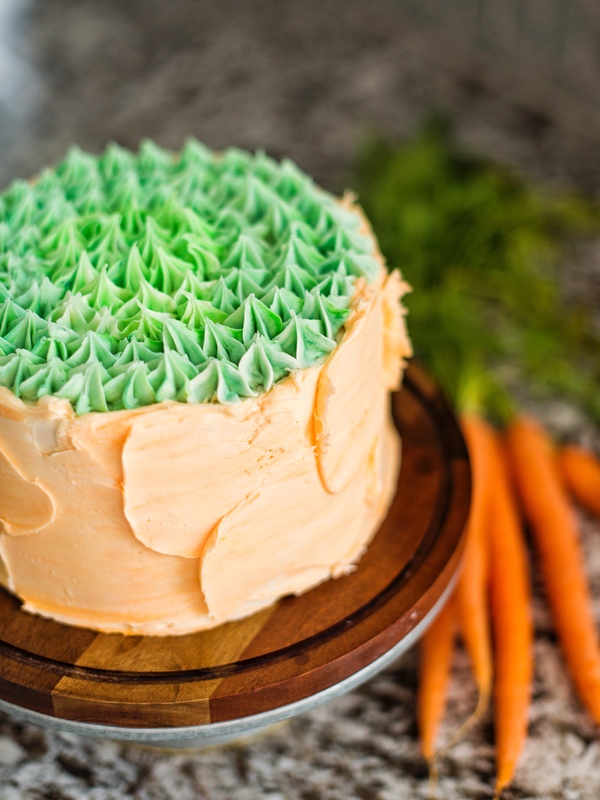 I racked my brain for something that I hadn’t seen used with carrot cake (i.e. no pineapples, no oranges, no strawberries) and something that would compliment the cake well. I landed on apricots and was so excited about it. But, if you caught my Instagram stories recently, you saw my excitement was squashed a bit when I realized I didn’t time my seasons right with this one! No fresh apricots in March. Duh! What was I thinking! Well, that wasn’t going to stop me. I went with my backup plan and snagged some canned apricots to make my compote. It worked beautifully. The other element I wanted to add to this traditional cake was some kind of texture, and not in the form of nuts. While talking to my mom about some ideas, she suggested trying something with pretzels. I wasn’t sold on it right away, but the more I thought about the crunchy, salty pretzels in this cake, the more the idea grew on me. I just needed to add them the right way. As I was thinking of how to create the right pretzel filling, I remembered Milk Bar has a recipe for Milk Crumbs, which is basically flour and milk powder baked in butter and covered in white chocolate. (Seriously heaven!). I played around with the recipe a little and subbed crushed pretzels for the flour and came up with the White Chocolate Pretzel “Crack” Filling. You guys! This stuff is no joke! If I were you, I’d make double the recipe called for because you’ll not only want to add more to each slice of cake as you serve it, you’ll want to snack on this stuff all day long. I then decided to go with a white chocolate buttercream like Rosie did in her cake. It’s a little less traditional and pairs perfectly with the apricot compote and white chocolate pretzel filling. Have I sold you on it yet? I really hope so because I can’t wait to hear what you think! Enjoy and have a wonderful Easter weekend. 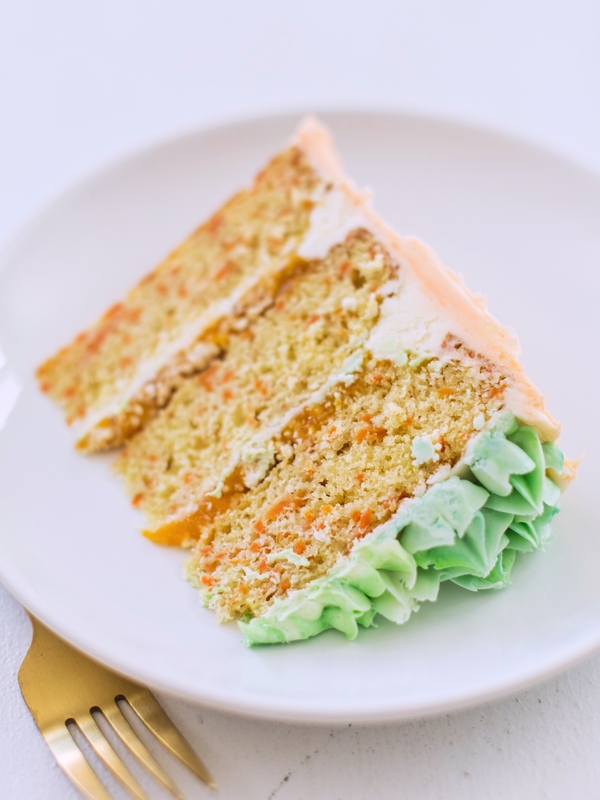 Carrot cake layers with an apricot compote, a white chocolate pretzel "crack" filling, and white chocolate buttercream. Preheat your oven to 350 degrees F. Spray each of the three 8-inch cake pans with nonstick spray, line the bottoms with parchment paper and spray again. Set aside. Grate the carrots using a food processor or use pre-shredded carrots from the grocery store. Measure out 5 cups. In a medium size mixing bowl, combine the flour, baking powder, baking soda, salt and ginger. Stir until blended. In the bowl of a stand mixer fitted with the paddle attachment, beat the butter until light and fluffy, about 2 minutes. Add the sugar and beat on medium for about 3 minutes. Beat in the eggs, followed by the vanilla. (Don't worry if it seems curdled). With the mixer on low, gradually add about one third of the flour mixture. Beat until just mixed, followed by half the milk. Repeat additions, ending with the flour. Stir in the carrots. Divide batter between pans, about 16 to 17 ounces of batter in each. Spread as evenly as possible to the side of the pans. Bake for about 23 to 25 minutes, or until a toothpick inserted in the center of the cakes comes out with just a few moist crumbs on it. Let the cakes cool for about 10 minutes in their pans before inverting onto wire racks to cool completely. Can be decorated once cooled completely, or to store them for up to a week, wrap each layer in plastic wrap and freeze. Before frosting the frozen cake layers, take them out of the fridge about an hour beforehand so the layers aren't too cold (which will harden your frosting as you start to decorate). Heat the oven to 250 degrees F. Line a baking sheet with parchment paper. Set aside. In a medium sized bowl, combine 1/2 cup milk powder, pretzel crumbs, cornstarch, sugar and salt. Toss with your hands to mix. Add the melted butter and toss, using a spatula or spoon, until the mixture starts to come together and form small clusters. Spread the clusters on a parchment lined sheet pan and bake for 20 minutes. The crumbs should be sandy at that point. Cool the crumbs completely. Crumble any clusters that are larger than 1/2 inch in diameter, and put the crumbs back in the medium bowl. Add the 1/4 cup milk powder and toss together until it is evenly distributed throughout the mixture. Pour the white chocolate over the crumbs and toss until your clusters are covered. Then continue tossing them every five minutes until the white chocolate hardens and the clusters are no longer sticky. The crumbs will keep in an airtight container in the fridge or freezer for up to 1 month. Combine the apricots and sugar in a small saucepan. Stir occasionally while the mixture comes to a boil. Once the mixture boils, turn the heat to low and let it simmer for about 5 minutes. Add the sifted cornstarch and stir until well blended. Pour the mixture into a blender and puree. Let cool completely before using in the cake. Best to make the compote a day or more ahead of time and store in an airtight container in the fridge. Pour the white chocolate chips into a microwave safe bowl and microwave for 60 seconds. Stir and, if needed, microwave for another 30 seconds. Set aside to cool slightly. Slowly add the cooled, but still warm, white chocolate while mixing on medium-low speed. Add the heavy cream, one tablespoon at a time. Once the cream is incorporated, add the vanilla and increase the speed to medium-high and beat the frosting for five minutes, until light in color and texture. Level each cake layer with a knife or cake leveler, if needed. 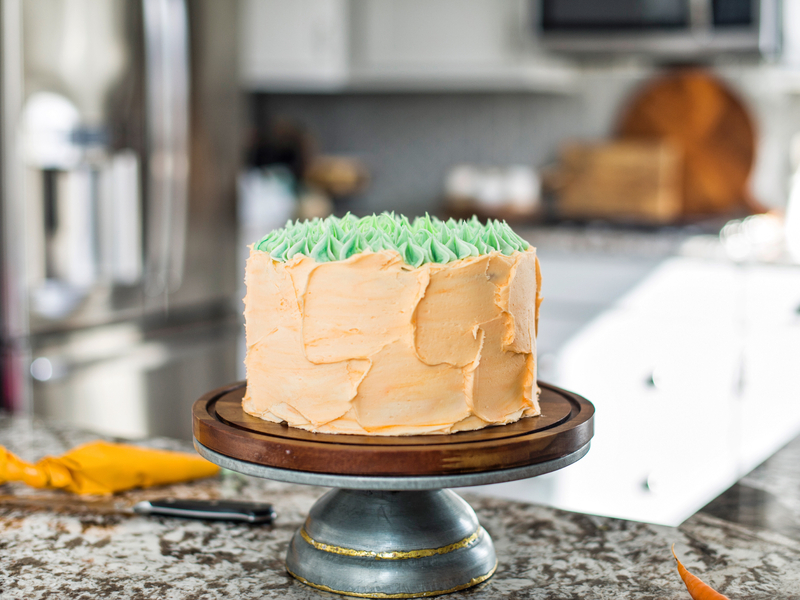 Place your first cake layer, right-side up, on a cake plate or cake board. Cover the cake layer with a thin layer of frosting, allowing some of the frosting to go over the edge of the cake, and then pipe a rim around the cake to act as a barrier to the apricot compote. Pour and spread about 1/4 to 1/2 cup compote over the cake layer. Cover with the white chocolate pretzel "crack" filling. Repeat step 2 and 3 for the second layer, and then place the final cake layer on top, top side down. 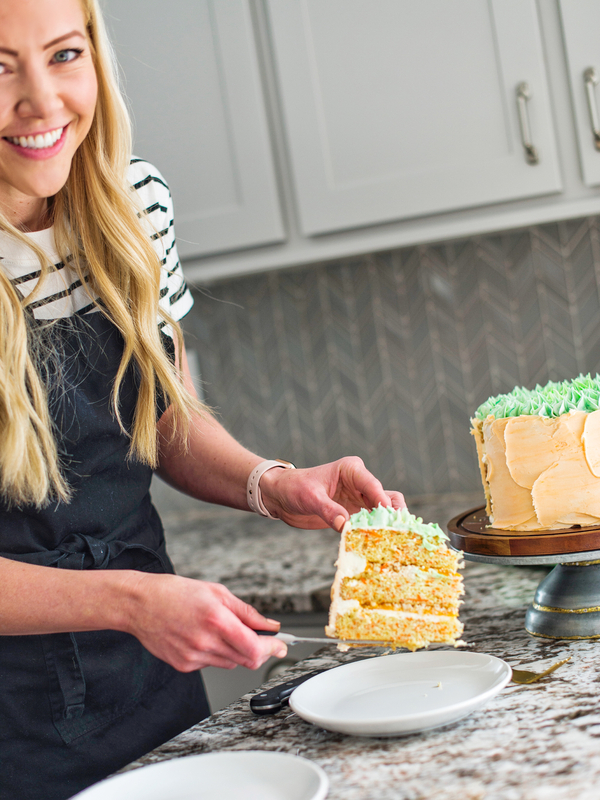 Frost the entire cake with a thin coat of frosting to lock in the crumbs. Freeze the crumb coat for 10 to 15 minutes. After the crumb coat is chilled, continue frosting the cake. 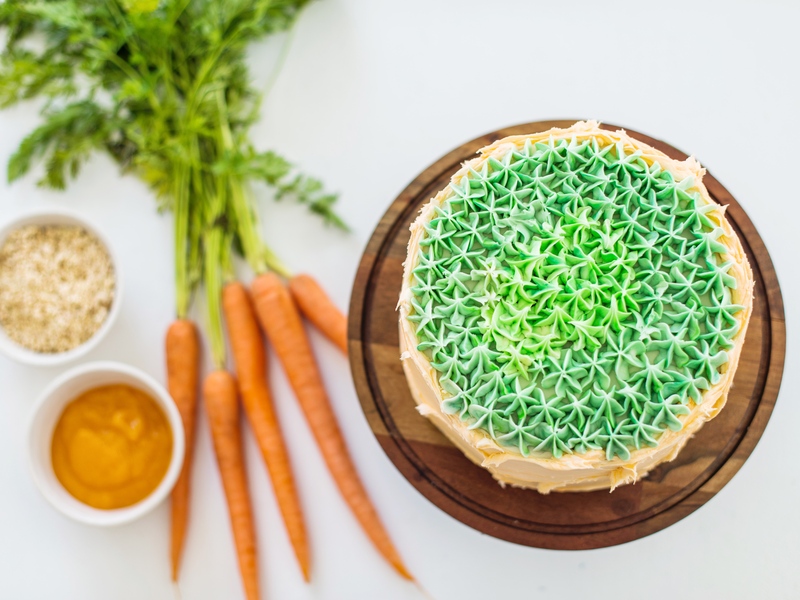 What coloring did you use for the orange and green? Could I add in 3/4 cup finely ground toasted walnuts to the cake batter or would it change the consistency? Thanks! I think that would taste great! What kind of milk powder do you use? The instant milk powder found at the grocery store, or something like King Arthur’s Baker’s Dry Milk powder? Just the basic instant milk powder found at the grocery store will work. What size cans of appricots? I can only find 15 oz and 2 of those seem like it would be more than the 2 cups of fresh apricots…. Where did you find the canned apricots? I can’t find them anywhere! Macey’s in Utah has them. If you can’t find them, use peaches!